Sustainability of water, sanitation and hygiene services: where does my research fit in? I’m going to be at a WaterAid West Africa workshop next week to discuss the challenges to the sustainability of rural water services in the region and help plan action research in each of WaterAid’s country programmes to address these problems. Sustainability is about whether or not WASH services and good hygiene practices continue to work and deliver benefits over time. No time limit is set on those continued services, behaviour changes and outcomes. In other words, sustainability is about lasting benefits achieved through the continued enjoyment of water supply and sanitation services and hygiene practices. 1. The limited capacity (in the sense of knowledge, skills and material resources) of communities, local government institutions and other service providers to manage systems. 2. The inadequacy of financial revenues to cover the full operation, maintenance and capital maintenance costs of infrastructure. 3. 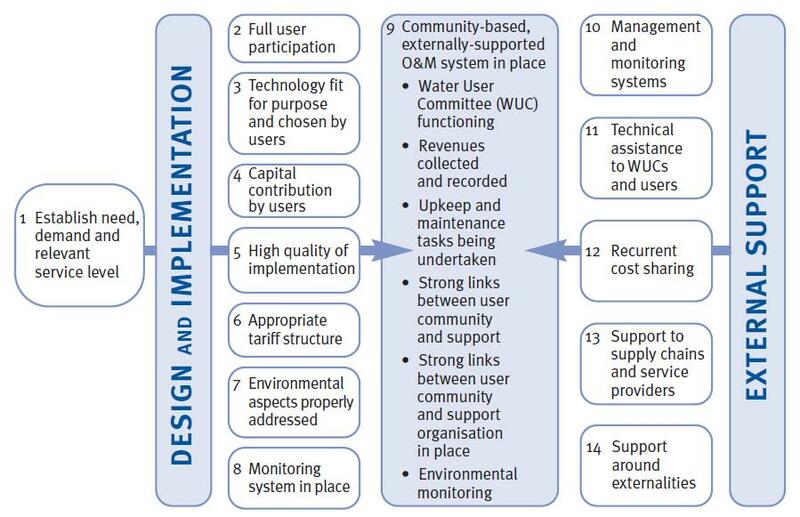 The historical approach to service delivery of different actors in the WASH sector. This has been carried out in a fragmented way, with competing agendas and a general disregard or lack of understanding of government frameworks. So where does my research fit into the concept? I’ve highlighted on the diagram below the key areas where my work focuses, given that my previous research with WaterAid in Mali identified ongoing financing as a major challenge – these are the three red circles to the right. A typical approach is to wait until money is needed to repair the water facility and then for someone in the village to try to collect money from all the users. However this often results in waiting weeks or months to get enough money together, for example until the next harvest when people’s cash incomes rise again. However other villages may have more innovative systems such as collective farming which is used to generate income for the water committee’s repair fund. I’ll explore some of these ideas in another blog post soon. However, two immediate lessons stand out. The first is the importance of understanding these financing mechanisms in the wider context of household and community financial management. There may be some truth in the idea above that a community has little cash until the next harvest, but research looking at how the poor manage the unpredictable nature of their cashflow and finances (see Portfolios of the Poor) shows that poor people often deal with paying for sudden unexpected expenses, such as medical costs, funerals and more. They typically do this through a wide range of savings and loans, of varying levels of formality. So if communities often use such financial instruments already, but not to help pay for water and sanitation services, we have to ask why. 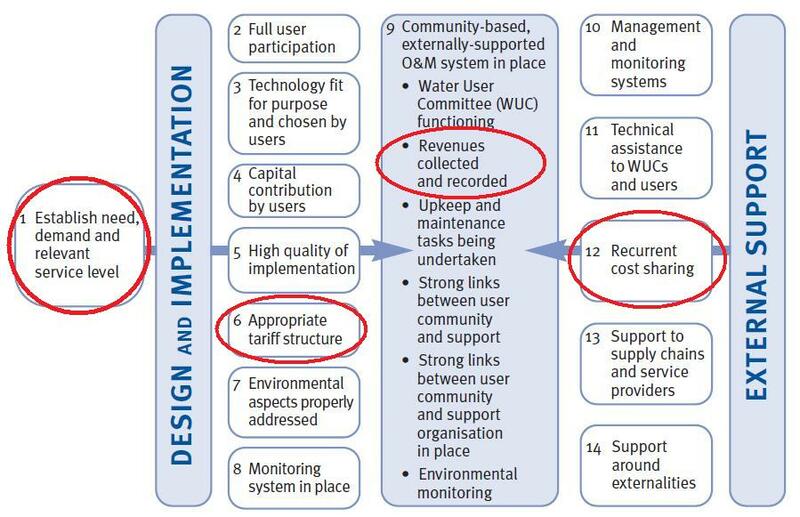 This leads to the second lesson: the fundamental importance of demand for improved WASH services, highlighted with the red circle on the left. This brings me back to the point I made graphically in a previous post by mapping households and the water points which they access. In that case, a household’s demand for the service from an improved water point was strongly affected by the distance from the water point – and of course demand is also affected by many other factors. These are examples of the challenging issues that the WASH sector must address more rigorously if services are really to become sustainable. Looks fascinating! Can’t wait to hear more about it. Have you ever met up with Duncan McNicholl (http://waterwellness.ca/)? He’s in Malawi working with EWB and WatSan Malawi and it looks as though some of the research and work he’s done on waterpoint functionality and waterpoint monitoring (especially with regards to community collection fees in the event of a damaged waterpoint) would align very well with yours. Good luck on your research! Thanks, I’m based in Mali (not Malawi, lots of people confuse this!) but I’m aware of the work EWB-Canada has done in Malawi on monitoring functionality etc, and I think many of the issues are similar. Haha, sorry – there’s also an organisation called WaterAid in Malawi, and my brain just skipped a few letters, sorry ’bout that. Good luck on your work! I really enjoy your blog. Don’t worry – WaterAid works in over 20 countries, but they are part of the same global organisation.